When Philadelphia’s soda tax rolled out in January, residents had a very immediate and visceral reaction, tweeting outrage at the new price of 12-packs (almost double), sometimes followed by subversive Google Maps screenshots showing the locations of grocery stores just beyond city limits. It’s no surprise this sticker shock would put a dent in Philly’s soda sales and buoy public-health advocates. What’s a little wild, though, is the extent of that effect thus far: Bloomberg reported on retailers’ sales since the start of the year, and the fallout for local businesses seems pretty severe. The city predicts declines will slow down as shoppers become “more used” to the new higher prices. 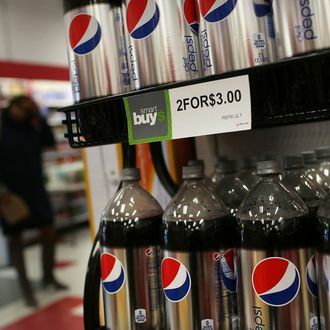 A 50 percent dip in sales is “significantly larger” than the impact sugary-drink taxes have had elsewhere, like in Mexico or Berkeley. But new research out this month shows the tax has had a pretty sizable effect on Mexicans’ soda intake, too, and the number of cities debating measures of their own keeps growing. The latest is Seattle, whose mayor last week proposed a tax of two cents per ounce.